Air bags are activated (able to inflate if necessary) only when the ignition switch is turned to the ON or START position. The appropriate air bags inflate instantly in the event of serious frontal or side collision in order to help protect the occupants from serious physical injury. There is no single speed at which the air bags will inflate. Generally, air bags are designed to inflate by the severity of a collision and its direction. These two factors determine whether the sensors send out an electronic deployment/ inflation signal. Air bag deployment depends on a number of factors including vehicle speed, angles of impact and the density and stiffness of the vehicles or objects which your vehicle hits in the collision.Though, factors are not limited to those mentioned above. The front air bags will completely inflate and deflate in an instant. It is virtually impossible for you to see the air bags inflate during an accident. It is much more likely that you will simply see the deflated air bags hanging out of their storage compartments after the collision. In addition to inflating in serious side collisions, side and/or curtain air bags will inflate if the sensing system detects a rollover. When a rollover is detected, side and/or curtain airbags will remain inflated longer to help provide protection from ejection, especially when used in conjunction with the seat belts. In order to help provide protection, the air bags must inflate rapidly.The speed of air bag inflation is a consequence of the extremely short time in which to inflate the air bag between the occupant and the vehicle structures before the occupant impacts those structures. This speed of inflation reduces the risk of serious or life-threatening injuries and is thus a necessary part of air bag design. However, air bag inflation can also cause injuries which normally can include facial abrasions, bruises and broken bones because the inflation speed also causes the air bags to expand with a great deal of force. There are even circumstances under which contact with the air bag can cause fatal injuries, especially if the occupant is positioned excessively close to the air bag. To avoid severe personal injury or death caused by deploying air bags in a collision, the driver should sit as far back from the steering wheel air bag as possible (at least 10 inches (250 mm) away). The front passengers should always move their seats as far back as possible and sit back in their seat. 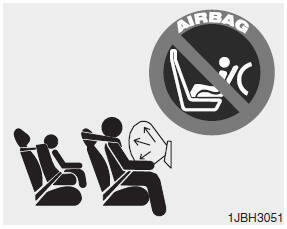 Air bags inflate instantly in the event of collision, and passengers may be injured by the air bag expansion force if they are not in proper position. Air bag inflation may cause injuries which normally include facial or bodily abrasions, injuries from broken glasses or burns by the air bag inflation gasses. Never place a rear-facing child restraint in the front passenger’s seat. If the air bag deploys, it would impact the rear-facing child restraint, causing serious or fatal injury. In addition, do not place front-facing child restraints in the front passenger’s seat either. If the front passenger air bag inflates, it could cause serious or fatal injuries to the child. When children are seated in the rear outboard seats of a vehicle equipped with side and/or curtain air bags, install the child restraint system as far away from the door side as possible. Inflation of the side and/or curtain air bags could cause serious injury or death to an infant or child.